The same month that Andrew Hanus finished serving six years in the U.S. Air Force, he began his undergraduate degree program at Arizona State University. By the following year, the 26-year-old was studying in Washington, D.C., launching a multi-million dollar initiative, and balancing 22 credit hours of online classes with a job at the White House. And he did so while earning straight A’s. How did he accomplish all of this? Hanus began interning at the White House Office of Science and Technology Policy as part of an ASU leadership program located in the nation’s capital. Hanus interned at the science division within this department. The department advises the President of the United States about the effects of science and technology on domestic and international affairs. It also works with local governments and agencies to develop policies informed by scientific research. Completing an internship in D.C. was part of the leadership program Hanus participated in. Offered by the ASU McCain Institute for International Leadership, the Next Generation Leaders program brings up to 20 students each year to D.C. to learn leadership skills and policy design. Students take part in a class once a week that simulates the daily work environment of a U.S. embassy, Hanus said, and they go to their internships on the other days. At the time of taking part in this program, Hanus also was earning his ASU undergraduate degree in science and technology policy. He took classes online in order to graduate on time. Finding a balance between all his responsibilities was challenging at first, Hanus said, but his military training helped him succeed. And while he does not have a plan when it comes to his future career, Hanus said he follows his interests and tries to excel at everything he does. Hanus said interning in the White House Office of Science and Technology Policy involved many different tasks ranging from talking to local government agencies about supporting an initiative to writing articles that provide the public with information about various White House projects. “That never really grows old,” he said. Hanus’ internship lasted a semester, during which he worked under the department’s directors including Associate Director of the Office of Science and Technology Policy’s Science Division Jo Handelsman. 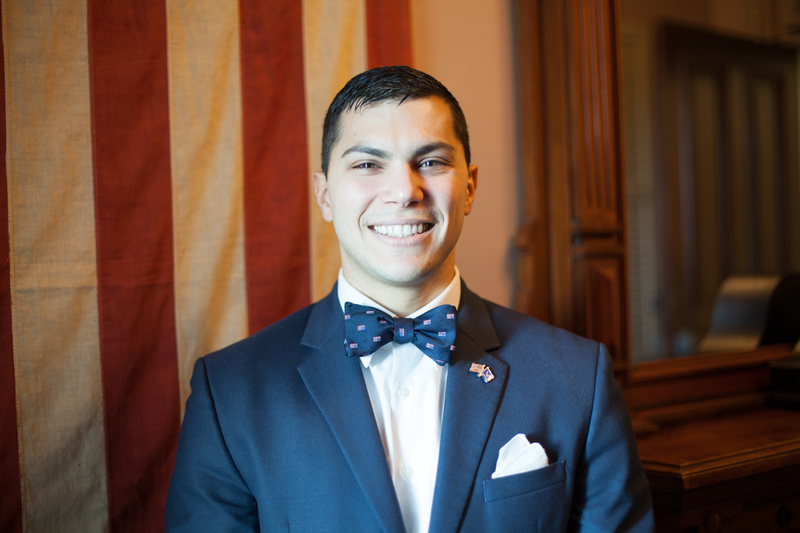 The work Hanus accomplished during his internship resulted in being invited to join the Office of Science and Technology Policy staff as a fellow for the following semester. By the time Hanus completed his fellowship at the White House, he helped launch a multi-million dollar initiative, led the planning for one of the department’s events, and helped set the foundation for new programs. The multi-million dollar National Microbiome Initiative supports interdisciplinary research, developing platform technologies, and expanding the microbiome workforce to increase the understanding of microbiomes. Microbiomes are the communities of microorganisms that inhabit the environment as well as people themselves, Handelsman wrote in the initiative’s online announcement. Recent science depicts larger organisms visible to the eye, such as humans and plants, swarming with these microorganisms. A colleague who was going to be leaving the department was running the initiative when Hanus was brought on staff. She passed the responsibility of directing the initiative onto Hanus. The initiative is funded with over 121 million dollars in federal money and 400 million dollars from private and public organizations around the country. “That was in large part due to his incredible relationships with the people he contacted and the excitement he generated for the microbiome [initiative],” Handelsman said. Hanus also planned the White House event announcing the initiative to the public, which meant managing the teams in charge of security, room reservations and other responsibilities. Even though overseeing all those responsibilities is a complicated task in the White House, Handelsman said Hanus kept on top of all of it and successfully ran the event with about 180 people in attendance as well as a large media presence. After launching the National Microbiome Initiative, Hanus worked with the Office of Science and Technology Policy to write material on the initiative. Once the brunt of the work was completed, Hanus then helped lay the foundations for the department’s soil and agriculture portfolio. Hanus said one of the greatest benefits of working in the department was being able to talk to experts in various fields. The military training that Hanus attributes to his success involved military-designed leadership courses as well as hands-on training. This leadership experience made him “conscious of relationships in the workplace and what it means to take leadership” and caused him to think about these matters more than most people his age have, Handelsman said. Handelsman said while Hanus often attributed his work ethic to his military training, there were qualities in him she believed were just part of his nature. Another factor contributing to Hanus’ success was his creative capacity that Handelsman said allowed him to solve problems and do work in the department in ways she, and perhaps anyone else on the team, would not have thought of. “He was really able to dissect and then solve a lot of the problems of moving forward with initiatives,” she said. This fall, Hanus is enrolled at Georgia Tech University to pursue two master’s degrees: one in public policy and the other in city and regional planning. With his military record, his ASU undergraduate degree, his experience with the McCain Institute and the White House Office of Science and Technology Policy, Hanus has a solid foundation for his career.